BETHLEHEM (Ma’an) — At least 41 people were killed and nearly 200 injured in two suicide bombs targeting a Hezbollah stronghold in the south of the Lebanese capital of Beirut, according to local news reports. Lebanese Interior Minister Nouhad Machnouk said initial reports indicated that two suicide bombers blew themselves up seven minutes apart. The [so-called] Islamic State [group] has claimed responsibility for the attack, Lebanese newspaper The Daily Star reported. 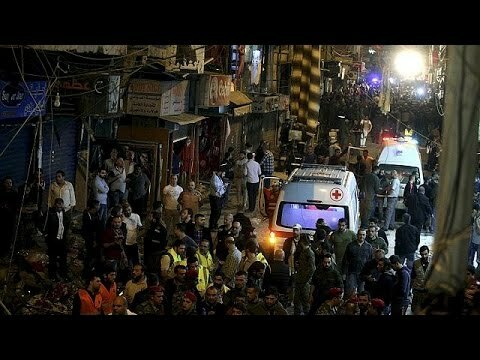 The explosions took place outside of a shopping center in the Burj al-Barajneh suburb, a primarily Shiite area dominated by the Hezbollah group. Hezbollah began deepening involvement in the war in Syria to support President Bashar Assad in 2013. While tensions in the Lebanese capital have risen around the group’s allegiance, Thursday’s attack was the largest to hit a Hezbollah-dominated area since it entered the conflict. International news agencies reported damage to buildings on the outskirts of the southern Lebanese suburb where IS carried out the attack. Burj al-Barajneh Palestinian refugee camp is located on the border of the neighborhood hit by the suicide bombers, and is home to over 28,000 Palestinian refugees.